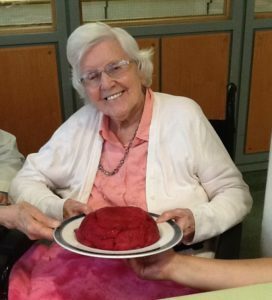 Our residents keep cool in the heatwave having fun making and eating that quintessential British pudding, summer pudding. Wash the fruit and place it all (except the strawberries) in a large pan with the caster sugar and 3 tbsp water. Gently heat for 3 mins until the juice from the fruit starts to seep out. Add the strawberries and cook for 2 mins more. Drain the juice from the fruit through a sieve set over a large bowl. Taste the juice and add a little more sugar if necessary. Line a 1.2-litre pudding basin with a double layer of cling film, leaving an overlap around the top. Remove the crusts from the brioche and slice the loaf into 1cm-thick slices along the length of the loaf. Cut 1 slice in half widthways and trim the corners to fit into the base of the bowl – you may need to use both squares, trimmed to fit. Trim the slices to the correct length to line the sides of the bowl. To assemble the pudding, dip the slices of brioche into the fruit juice, then use them to line the basin. Start with the bottom pieces, then lay soaked rectangles of brioche along the sides of the bowl. If you have any gaps left at the end, patch these up with any remaining brioche, but make sure you save some for the base. Tip the fruit into the lined basin. Finish the pudding with a layer of brioche to make a base, then pour over any remaining liquid. Wrap the overhanging cling film over the top. Place a small plate, which will fit snugly on top of the basin, over the cling film and weigh down with 2 x 400g cans of tomatoes or beans. Leave the pudding weighed down in the fridge for at least a couple of hours, or overnight if possible. 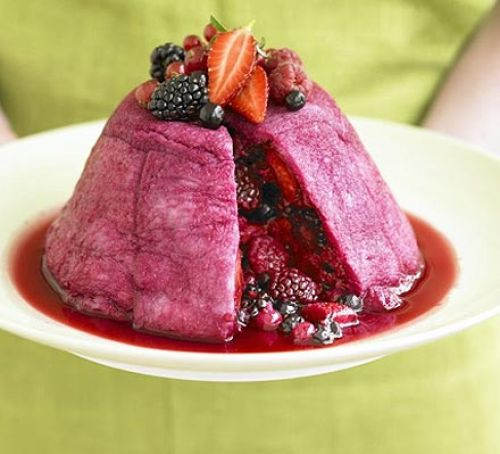 To serve, unwrap the cling film and place a serving plate over the pudding. Flip it over, remove the basin and carefully peel away the cling film. Serve in slices with clotted cream, if you like.